For small or midsize audiences of 20 to 30 people, the information on the screen needs to be clear for everyone. 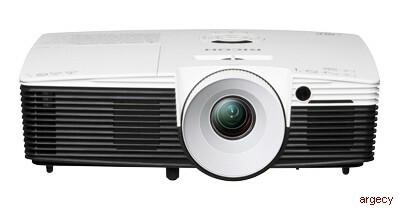 Good thing that Ricoh's PJ WX5460 projector includes industry-leading brightness that puts everyone in the picture - even when it's an image up to 300 diagonal inches. Don't panic if you're surrounded by green conference room walls or blackboards - you can still engage your audience and share information that's sharp and clear. The PJ WX5460 has automatic wall color correction and automatic keystone correction to easily fix any image distortion. Sometimes 3D is the perfect way to get your message across, especially when you're discussing your latest product enhancement, engineering model or scientific finding. The projector's ready; just purchase the optional 3D glasses. No need to budget for lamps anytime soon. You have 3,000 hours to work with - or 4,000 hours in eco-mode, because the projector automatically adjusts lamp brightness to conserve energy. Lamps are consumable products and therefore are not covered by the projector's warranty.